Every year, pets suffer and die from being left in a hot car. It may be for only a few minutes when a pet owner runs into the market, into school to pick up the kids, or to the mall for a quick gift. It doesn't have to been unbearably hot outside to be baking inside the car. 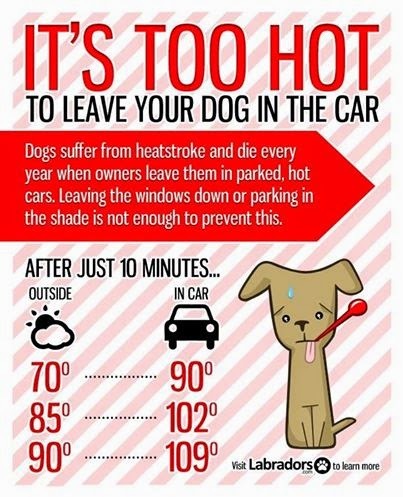 In as little as 15 minutes, your pet can suffer from heat stroke or even death. With summer fast approaching, consider visiting pet friendly establishments and taking your furry friend inside with you. Here is a list of some stores that have a pet friendly policy. Please, note that the dog-friendly policy may vary by location, be sure to call and verify in advance and confirm any restrictions. You want to make sure that you and your dog are welcome.